Empowering the whole family to move towards the Arabic fluency! Integrating Arabic in your life is the most effective way to move towards the fluency (experienced by the non-native speaker of our team)! To achieve this objective, you need to practice the four inter-dependent skills of the language: reading, writing, listening, speaking. Learning grammar rules and lists of words by heart is not effective until you use them through comprehensive sentences and conversations. If you want to pass on Arabic to your children, talking to them in Arabic will greatly benefit them since stimulating their listening and speaking skills are, in fact, the first steps to take in order to move towards the fluency. 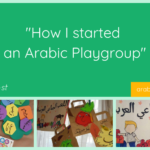 1) #myArabicSeeds: mini-videos with short Arabic sentences, based on pictures of the real-life sent by our followers, to listen, read, repeat and practice Arabic! There is often a misconception that you need to learn a dialect or “conversational Arabic” if you want to speak Arabic. We think this is one of the major reasons why learners struggle to move towards the fluency. The four skills of a language (read, write, listen, speak) are inter-dependent. They have inter-connected mechanisms in the brain. That’s why language learners need to practice them all. Only learning to write and read Arabic without listening and speaking is like considering it as a dead language. You can read the testimony of our non-native speaking Mum who started to speak Arabic in her daily life with her baby and boosted her own Arabic learning: she became able to have daily life conversations in Arabic, she acquired the vocabulary she was forgetting before because she was letting it in her notebook, and she acquired the Arabic grammatical rules and structures she was struggling to learn. A child raised in Arabic from Early Childhood naturally apply grammatical rules when speaking, even rules and structures seen as “difficult” by older kids and adult learners. It gives him a big advantage when he reaches the stage of reading and writing and a big start towards the fluency! And it is never too late for older kids!